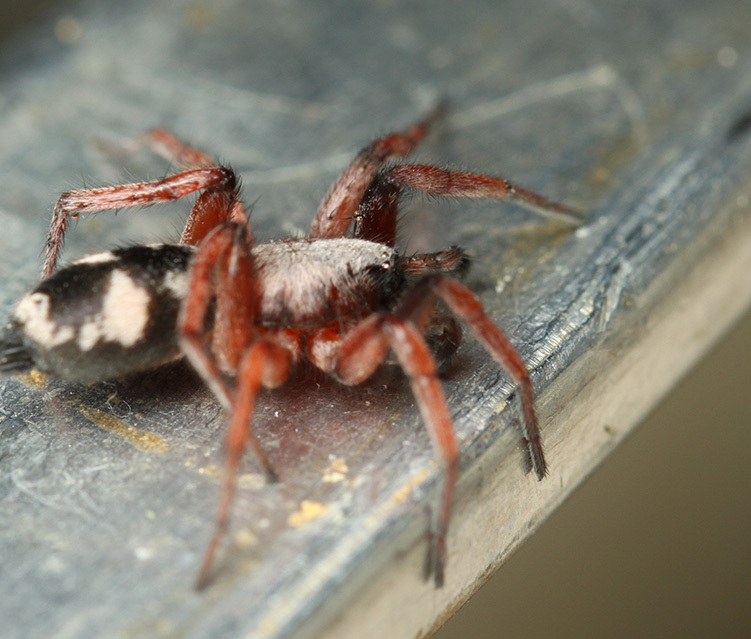 Yesterday afternoon, I walked past a doorframe in my project room and was surprised to see around shoulder level a boldly figured spider that obviously wasn't a jumper. When I approached to look closer, I was even more surprised to see the critter dive to the floor and take off sprinting. I'm pretty fast, but even so it was all I could do to get a hand in front of it to block its shortest escape route. No problem for the spider, apparently --- it just switched directions and sprinted for different cover. I blocked that route with an arm, then the next with another arm, and so on. This game went on for a frustratingly long time before it finally became apparent that the spider couldn't escape but I couldn't reach a container. Finally I decided to try something desperate, grabbed a nearby garment bag and threw it over the critter. Then I quick-quick fetched a container and pulled back the bag, expecting to see either 1) no spider at all, 2) a smashed spider, or 3) a blur. Sure enough, it was Option #3, the blur, and then the race was on again. Finally I took my best shot at aiming where I thought the critter was going to be, and to my great surprise clapping down the container worked! OK, one spider nabbed. Now what? Well, first off, I was curious to know what the beast was. So I transferred it to a clear-walled plastic container, shot a couple of snapshots, and sent them off to my friend Rod Crawford, who curates spiders at the Burke Museum at U.W. in Seattle. Very shortly he wrote back that the beast was "Poecilochroa montana, a.k.a. Sergiolus montanus, male. ... definitely one of our fastest spiders!" Armed with the ID, I looked up the critter and learned that it's a "ground spider" that normally hunts at night and hides during the day. BugGuide has a few pictures, but I was interested in taking a closer look. 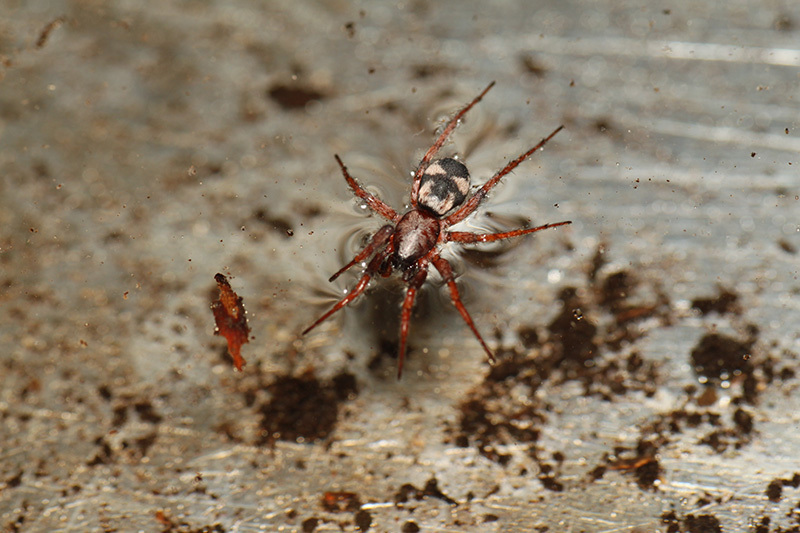 The spinnerets were particularly interesting, because they're different from what I'm used to seeing. 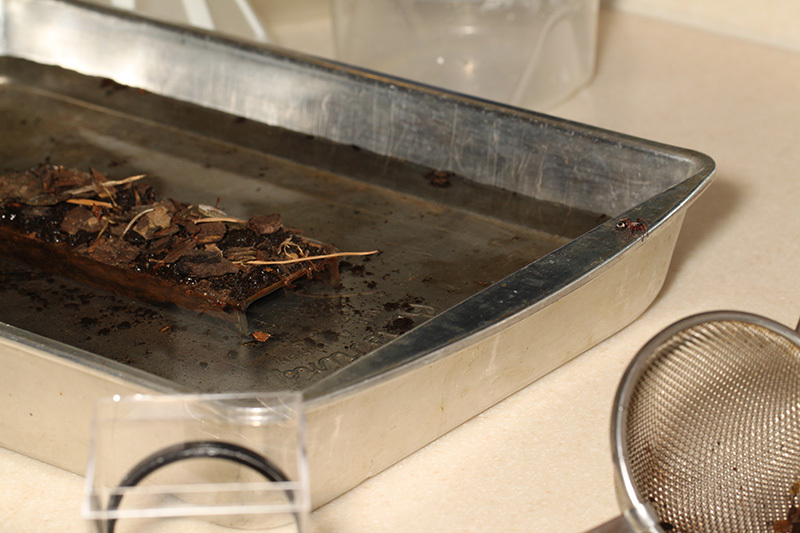 But there was a problem: I wanted to keep the critter live but I couldn't get a good picture through the walls of the plastic container that I had it in. That meant (gulp!) that I had to transfer it to something more suitable. Deciding to just "go for it", I hauled out a large aluminum pan, a chunk of old channel iron, some dirt, some bark, and enough water to make an island suitable for photographing the beast on. Anyway, that's the story of the spider. I'm posting it here in Technique in hopes that somebody can learn something from my experience. 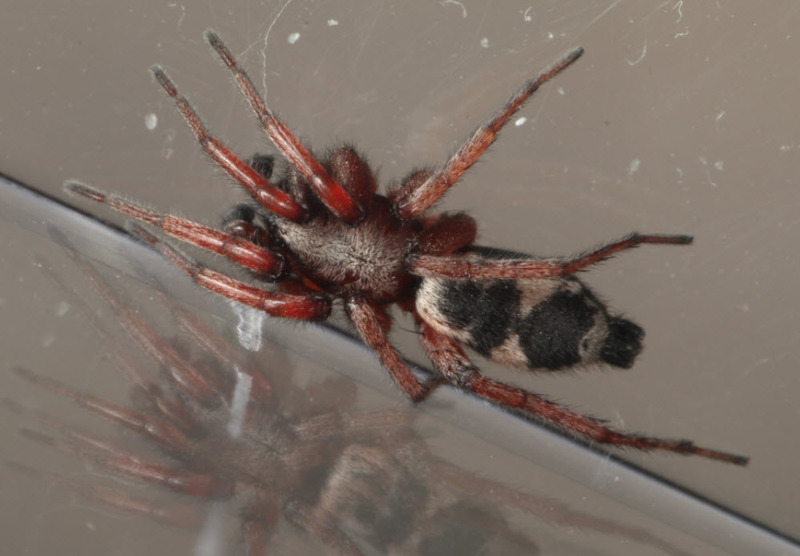 Oh yes, about those spinnerets... I photographed those this evening, and that turned out to be a bit tricky also. Turns out that the critter is willing to sit still for quite some time, but he doesn't like to be upside down, and I wanted a ventral shot. 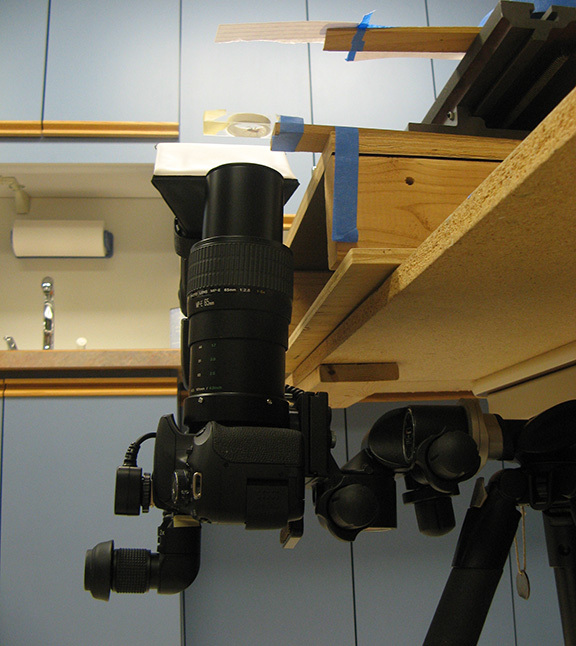 It consists of an MP-E setup mounted on a geared head tripod, looking up at a small cage containing the subject. More than a bit awkward to use, but it made the subject a lot more tractable. I decided to forego the StackShot for once, and just shot a short stack of a dozen frames by tweaking the MP-E focus ring. Here's the result. I hope this is helpful or at least amusing. The "inverted macroscope" was an excellent idea, so too the 'moat'. Also noticed your shoot through 'mini aquarium' in one of the shots where the spider is sitting on the edge of the pan "contemplating his next move". That image makes me smile when combined with the overall story. What a wonderful story, Rik. I enjoyed it very much , and kudos to your ingenuity and persistence. Miraculously, this spider ID was of great help to me and my partner - by chance we just found a moderately similar spider on our deck and simply could not find it or anything like it in our ID books or other resources. At first glance I even thought it was a jumper given how fast and how aggressively it hunted prey on our deck. Based on Rik's spider as a starting point, we were able to ID ours down to the limits of our ability. 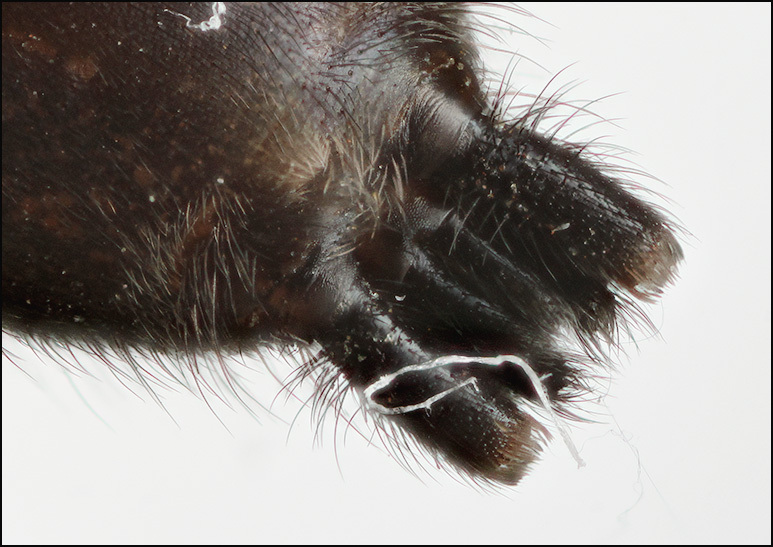 At the moment, we suspect that our spider is a Sergiolus capulatus. They really are fast! Also, I very much enjoyed this whole post as well as the photos! Thanks for the comments, guys. This one was definitely a learning experience for me. Just joined recently and want to thank you straight off for the set-up photos. I tend to 'attempt' shooting spiders in the field as I don't want to harm them and normally get so frustrated chasing them around that I end up just giving up, so to see your little island set-up is quite revelation for me. heh - " I learned that this spider really doesn't mind swimming. " Thank you for a GREAT story! You gave me some great ideas...And what a gorgeous spider! I don't live that far away (Vancouver, Canada) but I have never seen one like that...I'm envious! I half expected that, in the first scene, you would have resorted to dialing 911! The swimming pool, OK, but that high diving board is a step too far!